If Dainese is the Armani of motorcycle gear, Rukka is that six-figure Land Rover that just returned from trekking across the globe like it was no big deal. Think ultra-premium, no-holds-barred, top-of-the-line bombproof motorcycle gear. 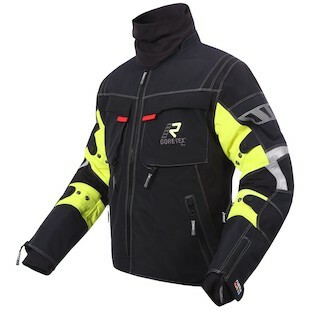 Imagine the best and newest, most protective materials synthesized into the king of all cold-weather riding jackets. Do that, and you have the new Rukka Armaxis Jacket. It’s like the Armas we’ve all come to love, but better. Thought the Armas was a little too bulky? Fixed! Wanted D3O? Done! Wanted a cappuccino maker? Done . . . uh, alright. So that’s one thing it doesn’t do. The Gore-Tex Pro Shell provides 3 layers of laminated goodness to keep all kinds of moisture out. Armacor panels make the asphalt think twice about attacking your skin. And of course, the obligatory aramid (Kevlar) fibers and genuine Cordura reinforcements don’t hurt either. The Gore Lockout zipper has been done away with in favor of a much less finicky waterproof YKK Aqua Seal zipper. Rukka’s D3O air armor covers the shoulders, back, and elbows. CE Level 1 for everything but the back, which is CE Level 2. You’re like the Black Knight, except on a motorcycle and you (hopefully) kill fewer people. Inside, there’s a removable Gore Windstopper jacket. And, get this: It’s a destination liner! Yup, wear it around town, wear it at your campsite, wear it in the wilderness -- do whatever you want. And in case your skin is oh-so-delicate, a detachable collar, both sleeves, and the main zipper are lined with a nice soft fabric made from elastic Gore-Tex stretch material. What’s the Armaxis missing? Well, venting, for one. There are some exhaust vents and a couple of zipper vents on the chest, but not enough to keep you cool on warmer days. The thing is, the jacket wasn’t really made for summer riding. If you happen to live where the sun doesn’t shine so bright, or need the craziest of crazy awesome winter jackets, you have a friend in the Armaxis.